There is no shortage of advances in AI these days especially as it relates to Deep Learning. From “Everybody dance now” where an AI-based Transfer Motion can make you appear to dance like a star, to an AI-based News Anchor in China that reads the daily news with impressive facial expressions and voice inflection much like a human. For Healthcare there has been much advances in medical imaging analysis from diagnostic imaging, to diabetic retinopathy, etc. to name a few. This is great news, but I believe more can be done, specifically as it relates to the use of AI in physician and hospital settings. The following are 3 practical ways to think about AI in healthcare. We’ve all heard the buzz around AI, and the rise of intelligent machines. While some warn of a Skynet world with terminator machines hunting down humans, I tend to take a more optimistic view, and welcome this new breed of intelligence as a partnership between humans and machines. Indeed, looking back at history this partnership has existed in one form or another. The agricultural revolution was possible because we initially leveraged the ox and plow to augment our strength, and later using much heavier machinery. The industrial revolution was possible because we used machines to augment the assembly line. Finally, the information revolution was possible because we connected machines and people together to augment our ability to share and collaborate on data. The revolution we’re experiencing today is the intelligence revolution, and again we’re seeing augmentation. This can be in subtle forms such as a recommendations by Amazon/Netflix or Google search results ranking. But it can also be not so subtle such as Tesla’s Autopilot, and self driving cars, or even down right unsettling such as Boston Dynamic’s humanoid robotics. The key theme here is augment to enhance our abilities and enable better decision support, not replace our human intelligence. The lesson here is to concentrate on narrow domain problems that are within reach of current AI techniques. This is especially true in healthcare where providers are overburdened with information and a flood of patients. There is a direct correlation between provider fatigue and avoidable clinical errors. Practical uses of AI can help by pin-pointing similar patients to doctors and recommending favorable treatment plans. Instead of doctors pouring over lengthy medical records, consuming much time and leading to potential omissions, AI can surface relevant summarized info based on the patient’s symptoms and visit history, or highlight allergies and adverse drug interaction that doctors might have overlooked. It can also point out inconsistencies in the medical records. The key point here is narrow your problem domain and think of applying current AI in practical ways. Hospitals and skilled nursing facilities employ an army of case managers to manage and track patients as part of their daily routine to ensure proper care. From admission to discharge, decisions are being made based a plethora of data points. This all too often can be overwhelming. Inevitably things fall through the cracks. There is no shortage of analytics with pretty graphs that slice and dice data into different perspectives and views. Often times this leads to graph and data fatigue, as a case manager glances from one screen to the other. The excitement and value of looking at graphs is lost with time. What if intelligence is applied to those graphs? What if a virtual assistant can nudge your attention to key insights which you might not gleam just by looking at those graphs? The assistant can help case managers to navigate to those patients that require immediate attention, because it can detect anomalies that may not be so obvious. Initially that assistant should start with intelligence as a set of well-known rules. With time and through the accumulation of actual usage data, it can learn by applying deep learning over the data collected. The key point here is, aim to deliver immediate value by priming AI with rules and later applying deep learning to generate more advanced rules based on patterns found in large volumes of real data. 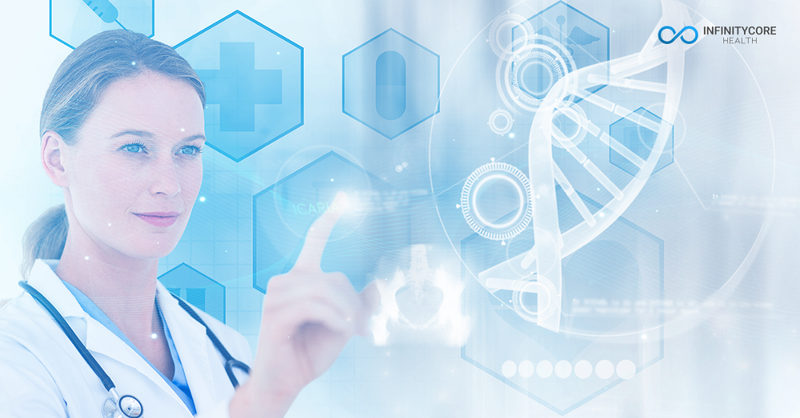 At InfinityCore Health we are employing AI in practical ways, to find out more click here.